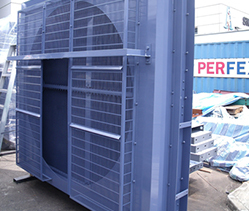 Set Mounted Radiator | Perfex International Pte Ltd - Radiators, Charged Air Coolers, Heat Exchangers and Oil Coolers for power generation and other industries. Set mounted radiator is generally used in power generator sets using diesel engines. Mounted on the same skid as the engine, the radiator uses the engine driven fan to provide cooling airflow. Set mounted radiators are generally suitable to be used with Mitsubishi, John Deere and other diesel engines. As per customers’ requirement, Perfex can customise the set mounted radiator to include/exclude axial fan. Copyright © 2019 Perfex International Pte. Ltd. All Rights Reserved.